Accidents don’t always happen during the work day, which is why our Grand Island, NE dentists and on-call staff members are available whenever you experience a dental emergency. If you need urgent care during office hours, you can rest assured that we will be able to see you as soon as possible. Once we diagnose the problem, we will carefully explain the cause of your pain and the treatment options to resolve it. Whether you are suffering from pain, swelling, knocked-out teeth, or trauma, you can trust that your smile is in great hands at Island View Dental. Do you know how to handle a dental emergency? We always advocate for calling our office, but in the meantime, here are some helpful tips on alleviating discomfort at home. Bitten lip or tongue: Apply pressure and cold compress to minimize bleeding and inflammation. Object caught in teeth: Avoid eating in area until you can be seen. Broken, chipped, or fractured tooth: Avoid hot or cold beverages and food until you can be seen. Knocked-out tooth: If possible, place tooth back in socket. If this is not an option, place it in milk and get to our Grand Island dental office within one hour. Do not place the tooth in water. Toothache: Take over-the-counter pain medication, taken as directed, until you can be seen. 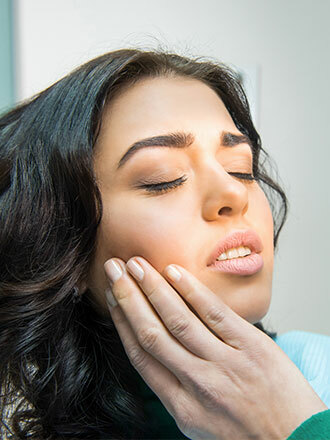 Broken jaw: Avoid moving the jaw as much as possible. Go to our office or an emergency room as soon as possible.